For things to do or places to visit and children’s days out in Cumbria & the Lake District, Hadrian’s Wall or South-West Scotland, Walby Farm Park has it all! Enjoy a family day out at Walby Farm Park! Just 4 miles from Carlisle and the M6 motorway (J44). FROM CARLISLE & M6 – we are located just to the east of the M6. Please follow signs for A689 (E) towards Brampton and Carlisle Airport from M6 (Junction 44) & turn off left to Walby. 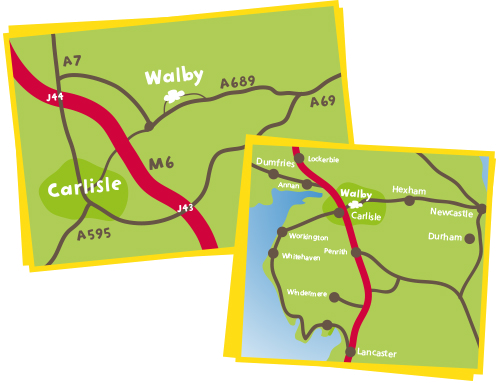 FROM HEXHAM & A69 – find us off the A689, near Carlisle Airport, 35 miles from Hexham & 4 miles from Carlisle follow signs for Carlisle A69, at Brampton roundabout take the 2nd exit onto the A689 (signposted Carlisle – North) & turn off right to Walby. Bicycle rack available at entrance. For more information on cycling in the area – http://www.cycle-routes.org/hadrianscycleway/ . Walby Farm Park is also linked to the village of Crosby-on-Eden by public footpath – a short 1.5 mile walk.